Neural networks can achieve strong predictive accuracy in situations in which predictor variables exhibit nonlinear relationships with the targeted outcome of “dependent” variable. However, a significant drawback with neural networks is their "black box" nature. It can be difficult to impossible to understand the “why” behind a neural network’s predictions. The goal of "explainable machine learning" is to address this black box challenge. 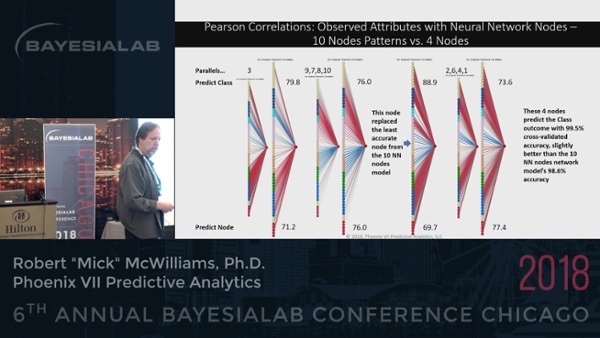 This presentation reports results from an initial experiment that uses the often-explored Sonar data set to test whether a synergetic combination of BayesiaLab and neural network modeling might be able to address the explainable machine learning challenge while possibly also increasing the accuracy of predictive models. Robert “Mick” McWilliams is President & Principal Consultant at Phoenix VII Predictive Analytics. Phoenix VII which provides advanced machine learning and predictive analytics services to an array of marketing research industry clients and specializes in Bayesian network modeling using the BayesiaLab platform. Mick earned his PhD in Research Sociology from Virginia Polytechnic Institute & State University. Prior to founding Phoenix VII, he held senior VP level data scientist roles for three prominent marketing research firms.